Ever feel stuck with left over yarn from your latest corchet or knitting project? Pom Poms are a super cute and easy way to get rid of excess yarn without having to buy more for another project or even worse, throwing it out in the trash. A Rug Mat. I like to use a non-slip kind. You can find them most places, I personally like the LINENSPA Non-Slip Area Rug Pad that I’ve gotten through Amazon in the past, but you can use any rug mat that you can attach your pom poms to. A selection of yarn. How much you will need will depend upon what size of rug you want. Crafter’s choice on colors too! If you’re stuck, check out my article on Colour Selection for some inspiration. Pom-Pom maker or you can craft your own using scrap cardboard (Craft Train has a helpful article here). What I do is I just create different pom poms and attach them to the rug mat until your mat is wholly covered in pom poms, I use the tails of the pom pom to thread into the mat, tying a knot at the bottom. When you’re done, just trim off the ends and set that mat down where you want it. 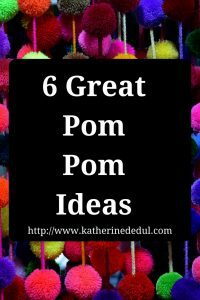 You can either do all your pom poms at the same size or mix it up with assorted sizes for a little bit of whimsy. You can make a whole menagerie. I’ve even seen lovely ideas like creating pom poms from Angry Birds to muppets. Keychains are super simple to make. I like to jazz it up a little with a few different pom poms tied together and around a key ring. I prefer to go small, but there’s no reason you can’t make a big pom pom and loop it into a keychain! Have a piece that just is missing a neat little pom pom? Beyond sticking one of these onto a hat (like a toque! ), you can attach them to the ends of shoelaces, replace a drawstring cord with a pom pom ended one on your favorite sweater and even pom pom earrings! A super simple way to create a bookmark (particularly if you have my luck and you keep misplacing them). To create, I like to make one pom pom with two long tails. When tying off the pom pom in the maker, I’ll just be sure to create two long tails with the thread. 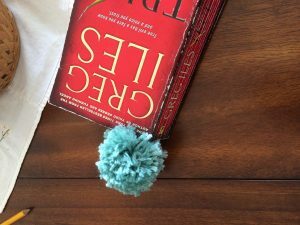 Once you’ve secured your pom pom, you can twist the two tails around until they are taut, tie them off and create a beautiful little spiral to tuck into your book. Otherwise, you can just leave a single string, the book hides anything plain looking. For those who are curious, the book is “True Evil” by Greg Iles and though I haven’t quite finished it as of the writing of this article, it’s super exciting if you like suspenseful murder mysteries! Pom poms are an effortless and quick way to jazz up some of your home decor. Google is your friend for inspiration. I’ve seen everything from simple little curtain tie backs all the way up to redoing a stool. My advice here is if you have something in your house that is so plain that you hate its very presence, maybe accenting it with good quality yarn pom pom might change your perspective. If not, still to the craft and then sell it or gift it. Also, don’t forget that pom poms can be adapted seasonally. For a switch, do a garland or wreath with some pom poms instead of the usual ribbons and glitter, for any holiday that you like to decorate for. Yarn comes in all colours and weights for a reason! Did you enjoy this article? Be sure to share this post on social media! Also, if you want to receive more crafty ideas, delivered straight to your inbox, enter your email down below. As a thank you, I will give you the very worksheet that I use when I need to complete a new craft for here on the blog! Copyright © Katherine Dedul 2019. All Rights Reserved.